Moldavite, green Tektite from the Czech Republic. Rare stone with high vibration merging terrestrial and cosmic energies. Legally found that there is no damage is made to the nature. 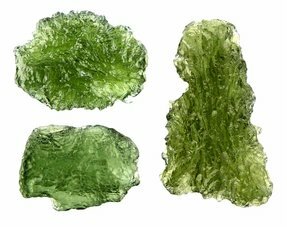 Moldavite was created some 14.2 million years ago by meteorite impact. As a result of the impact, an enormous heat was released, which turned earthly rock and sand into glass. This glass, which is a mixture of meteorite and earthly material, was spread over an enormous distance due to the force of the impact. These' glass droplets' are also called tektites. 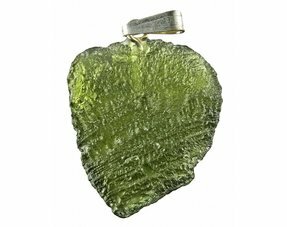 Moldavite is the only tektite in the world with a beautiful green color and makes it unique in its kind! These pieces were found in: Chlum nad Malsi, Bohemia, Czech Republic. These pieces were legally won and sold. No damage to nature has been done! Moldavite is often used for meditation purposes, because of the fusion of extraterrestrial and earthly energies the stone has a high vibration. The moldavite stimulates other crystals and the higher awareness within ourselves. 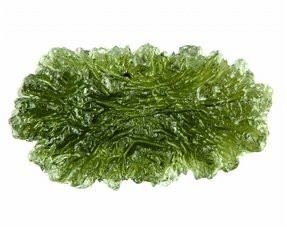 The Moldavite is extremely popular to come into contact with the higher spirituality. Moldavite is unique and only occurs in 1 place in the world. The volumes found are declining and prices are rising rapidly.